This entry was posted in Podcast Episodes and tagged Adrian Brody, andy serkis, Jack Black, Jennifer Anniston, Justin Theroux, King Kong, Malin Akerman, Naomi Watts, Paul Rudd, Wanderlust by Jared. Bookmark the permalink. I don’t know that Wanderlust is the type of movie that I would typically enjoy, but i did enjoy hearing you two talk about it. I can’t believe I sat though King Kong either, way too long and brought nothing new to the table. Total snooze fest. But then again, the Lord of the Rings movies bored me too. Bad Taste, Braindead (Dead Alive in America), Frighteners, and Heavenly Creatures are all really quite fantastic movies, so Peter Jackson has some good tightly written one’s in him. I have a hard time thinking of movies to recommend to you since Jared and I have similar taste and probably seek out the same type of movies. 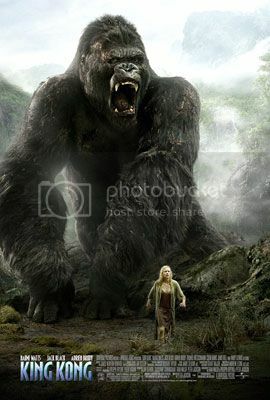 I love all of Peter Jackson’s other films, but I haven’t seen his “King Kong,” yet. However, I did want to add one little historical context to your viewing: The flick, like the original, is set in the 1932. This is only 14 years after World War One. Every guy you see in “King Kong” (original or remake) has had experience running through field and forest, reading compasses, and cleaning & firing firearms. Even pudgy scriptwriters/producers/directors. Anyone who had survived the trench warfare and newly invented “mustard gas” chemical weaponry of “The Great War” was an “action hero” for their generation. Keep this in mind when you judge what action is “realistic” or not. I didn’t think about that re: WWI, but that’s a really good point. I guess that’s one mark I can take away. The rest of it still seemed a mess though.